While this winter has yet to really present itself in Southwest Michigan, you’ll still want to be ready for when it gets here. A few seasons ago here in Kalamazoo, we had many calls in the spring from owners about the loss of their fish. Winter fish loss happens…and it happens to even the most meticulous pond owners. Here are some tips on preventing winter fish loss in Kalamazoo. This is our number one winter fish care product to use in your pond when it starts to freeze over. During the cold winter months you need to keep a hole open in the ice in order for proper gas exchange to occur. If you let the pond ice over with no hole, and allow it to stay that way for the duration of the season, you can almost guarantee not many of the fish will make it through to spring. 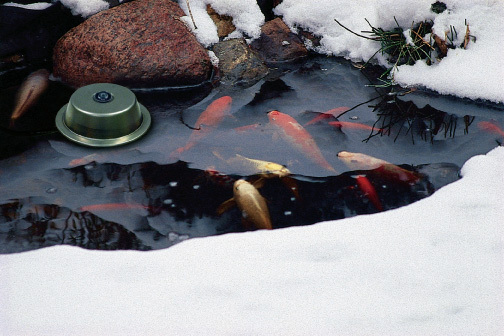 The pond de-icer/heater is simple and easy to use, making it our number one choice to help prevent fish loss. With a built in LED light at the top, you can look out the window from the comfort of your warm home and see that your heater/de-icer is operating. Requiring only 300-Watts of electricity to run, our pond heater/de-icer is energy efficient, and actually results in a heater that costs 5x less to operate than a traditional heater/de-icer you could find in the market. It’s durable. Heck, anything in Michigan needs to be durable to survive our winters! The stainless steel construction prevents corrosion, cracking or other issues that may occur in extreme weather. In need of a pond heater/de-icer, or need additional information? Click below to get started.